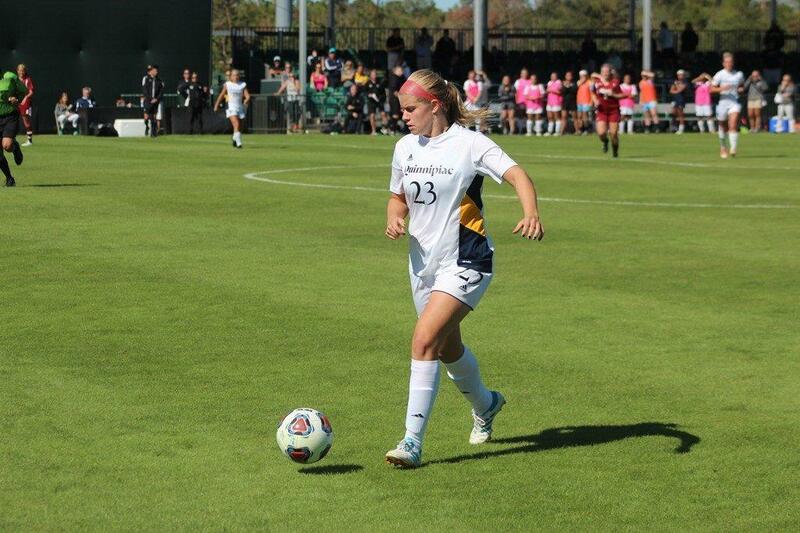 Thanks to second-half offensive surge, the Quinnipiac Bobcats women’s soccer team (5-4-1, 2-0-1 MAAC) found their way past the Iona Gaels (2-9-0, 0-3-0 MAAC) on Wednesday afternoon. Despite being in total control, nothing came easily for Quinnipiac in the first half. Iona played a “bend but don’t break” defensive game for the first 45 minutes, giving the Bobcats trouble inside the penalty box. Iona interim coach John Stalzer made sure the middle part of the field was heavily congested, and Quinnipiac ended up not getting a shot on goal for the entire half. To make matters worse, Quinnipiac’s leading point scorer, Lauren Triglione, went down hard on a tackle with about 15 minutes left in the first. She remained on the ground before being helped off by trainers and did not return. After the rough first half, Quinnipiac wasted no time getting things going in the second. About ten minutes in, Emily Loney, who replaced Triglione, made a strong run into the box, and after a few deflections, the ball found its way to the foot of Kelsey Goldring. She took one touch before delivering a semi-sliding strike past a sprawling Emma Havrilla to break the deadlock. It was Goldring’s team-leading fourth goal of the season. After drawing first blood, the Bobcats pounced. The offense started to spread Iona out, which finally opened up the middle of the field for the playmakers. Two of those playmakers, Ally Grunstein and Al Pelletier, took full advantage. With about 25 minutes left, Grunstein threaded the needle and delivered a beautiful pass to Pelletier, who struck a one-timer past a helpless Havrilla. However, the ball glanced off the post, and Iona caught a major break, as it remained a one goal game – it didn’t stay that way for long, however. Only 40 seconds after the miss, Quinnipiac’s Jenn Maldonado fed Pelletier once more. She calmly put one past Havrilla, no post necessary, and the Bobcats went up by two. Pelletier credits her determination for her second goal of the season. “I saw (the first shot) hit off the post, and I said ‘I need to get back in this and I can’t give up.’,” said Pelletier. “So when I had the other opportunity I was like… I hope someone finishes off of it or hope it rolls in the back of the net.” Luckily for her, it was the latter, and it seemed like Quinnipiac had finally gained control of the game – until they didn’t. Iona went for broke offensively to get back in the game, and 90 seconds after Pelletier’s goal, the Gaels’ Amber Crispin struck a sublime finisher off a volley from just inside the box to make it a 2-1 game. After this, though, Quinnipiac’s defense tightened back up for the rest of the game, and Iona was mostly stifled. Quinnipiac will look to continue their two-game winning streak on Saturday at Niagara at 1:00, while Iona hopes to rebound this Saturday at Canisius, also at 1:00.